These Jumbo paper clips are just brilliant business gifts to hand out regardless of exposure you are seeking. Small and versatile, these Jumbo Paper Clips will clip multiple documents and will offer a practical solution. You could clip one to an invoice an the customer will simply re-use the promotional paper clip later on. Personalised with logo branding in a one colour print, you can gain exposure of your Company brand-name and logo with ease. 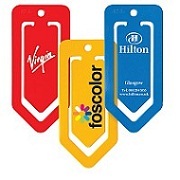 Add some flash to your invoice with branded Jumbo Paper Clips! For a FREE QUOTE, please fill in the form regarding our Jumbo paper clips and we'll be able to help you.